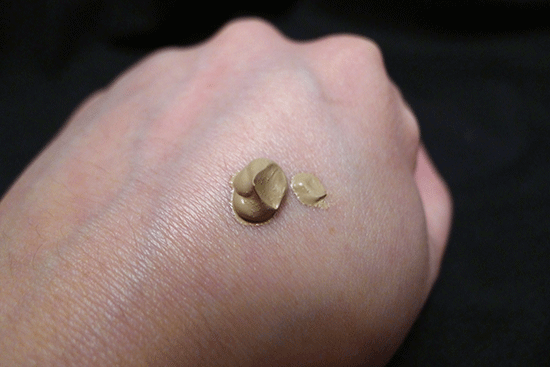 This review marks the last Missha BB Cream review you’ll see from me for a long time! There are a couple more BB creams in the Missha lineup that I have yet to try, but my product queue is growing larger every day, so it’s time for me to move on to some other brands. This Cho Bo Yang BB Cream is from Missha’s MISA line, which is their Oriental Medicine line of skincare products. I absolutely love the packaging for this BB cream. It looks so classy and refined on my counter! MISA Cho Bo Yang BB Cream promises to repair wrinkles, whiten, and block UV Rays. It also offers SPF30/ PA ++ protection. Korean Wild Ginseng Extract: This is a popular Asian skincare ingredient, which helps balance oil production and preserve elasticity. There are many scientific studies on Ginseng and skincare benefits available, including this one, which reveals Ginseng to be effective at reducing UVB damage, and this one, which shows Ginseng to have wound healing properties and the ability to increase collagen production. Cordyceps Sinensis: This ingredient is particularly interesting – it’s a fungus/mushroom that grows on caterpillars in the mountains of China. In Chinese and Tibetan medicine, it is used in its ingested form to treat renal failure, hepatitis, as a chemoprotective, and even as a performance enhancer. I couldn’t find any detailed information in laymen’s terms about what kind of skincare benefits it offers other than “antiaging.” However, I did find this abstract, which showed that topical application of Cordyceps on mice inhibited the signs and symptoms of atopic dermatitis. I also found this study, which shows that Cordyceps effectively reduces UVB damage in human skin cells. Pure Gold: Yeah, this is kind of a BS ingredient. It’s a semi-popular skincare ingredient, and claims range from “boosting blood flow” to “activating cell regeneration.” Although many people swear by gold as a miracle skincare ingredient, there is no scientific data to back up those claims. Additionally, gold particles can sometimes cause contact dermatitis, and gold nanoparticles have even been shown to increase cell death when combined with UV rays. This ingredient, unfortunately, does more harm than good. Luckily, it appears last in the list, so this BB cream probably doesn’t contain enough of it to cause problems. Licorice Root Extract: One of my favorite skincare actives – licorice root is anti-inflammatory, anti-viral, anti-bacterial, and has skin brightening properties. Pumpkin Fruit Extract: Reliable source of antioxidants, including Vitamin E. Also contains lots of beneficial essential fatty acids. Garlic Bulb Extract: Anti-fungal, anti-bacterial, and anti-viral – topical application can be a beneficial acne treatment. According to COSDNA, there are no red flag acne triggers or irritants in MISA Cho Bo Yang BB cream. The first thing I noticed about this BB cream out of the tube is that it’s extremely thick compared to other BB creams I’ve tried. Texture-wise, it’s right up there with my Kat Von D Lock-it Tattoo Foundation. 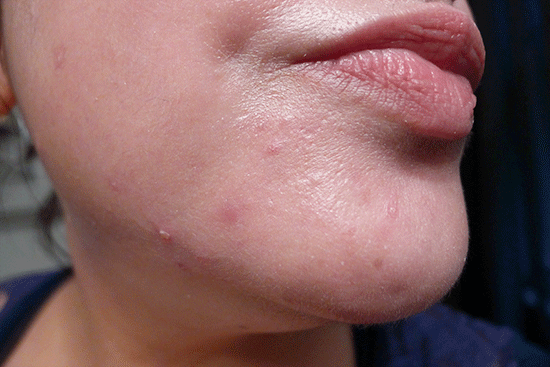 The texture didn’t pose any problems with application though – I found it very easy to work with and easy to spread. The second thing I noticed was the smell. It’s a little odd – sort of a mix between herbs and ashes. The smell isn’t very strong, and it disappears pretty quickly after application. 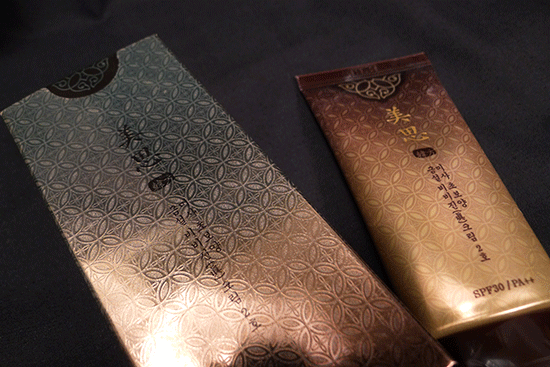 MISA Cho Bo Yang BB Cream comes in two shades: No.1 Natural Beige, and No.2 Calm Beige. I opted for No.2 Calm Beige. This turned out to be a great color match for my NC25 skin. In Missha Perfect Cover BB Cream, I am #23, for reference. I think No.2 Calm Beige would be a great match for those who can wear Missha #23 to Missha #27. As one might have guessed from the texture, Cho Bo Yang is definitely a full coverage BB cream. I am especially thankful for this at the moment, in light of a product reaction I’m experiencing from some recently tested products. Even though the coverage is heavy, it looks really natural. It just looks like smooth, even bright skin. The finish is semi-matte. My skin type is dry, and I do find that about halfway through the day, Cho Bo Yang dries me out a little. A facial mist or a touch-up application of the BB cream alleviates the issue, and the dryness isn’t so severe that it’s causing any flaking. It just makes my skin feel tight. This isn’t a dealbreaker for me, and I think it bodes well for how it would perform for those with oily skin types. 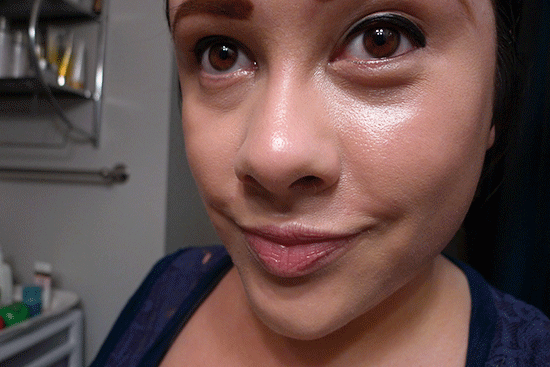 BEFORE: My face has been prepped with the Banila Co. CC Cream I reviewed yesterday. 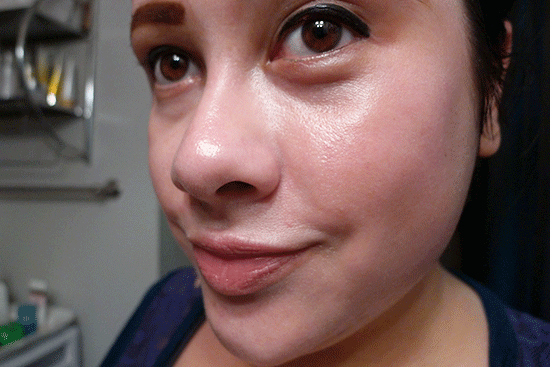 AFTER: This is minutes after applying Missha MISA Cho Bo Yang BB Cream in No.2 Calm Beige. The finish is actually more matte than it looks in my photo. You can thank my unpredictable bathroom lighting for that shiny spot! BEFORE: This is my product testing breakout area, prepped with the Banila Co. CC Cream from yesterday. 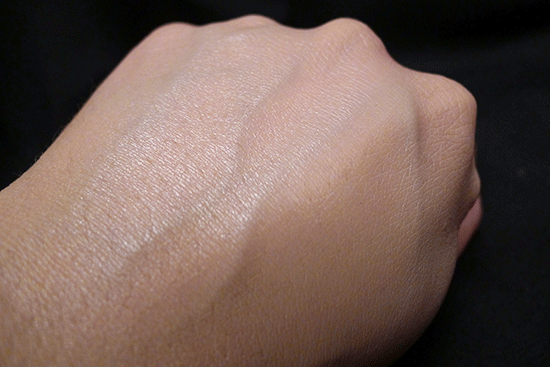 AFTER: This is the same area, just a few minutes after applying Missha MISA Cho Bo Yang BB Cream. Much better, though I probably could have rubbed it in a little more. My camera + lighting combo was particularly unforgiving that day! I didn’t see any visible changes in my skin condition after using this BB cream regularly (but not daily) for several weeks. 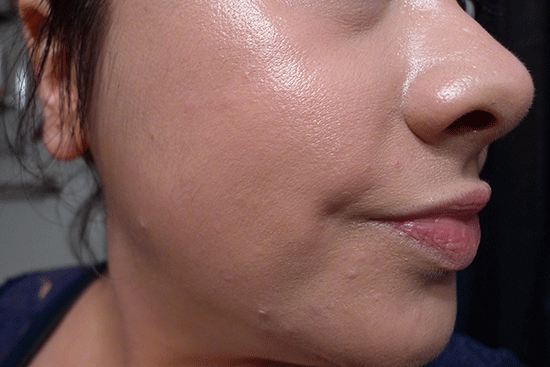 I am coming to terms with the fact that although my BB creams contain a lot of great skincare actives, they don’t seem to contain enough of them to make a dramatic impact on my skin’s condition. Still, I really like this makeup, and I like to think that those actives make Cho Bo Yang (and my other BB creams) a little better for my skin than a standard foundation. Performance: 4/5 – Great, natural looking coverage. Can be drying on dry skin. Quality: 4/5 – Lots of nice skincare actives, and no major acne triggers or irritants. Packaging is nice, though I wish it had a pump! Value: 3/5 – $46 is steep for a BB cream! However, there are deals to be had, and it is a good quality makeup. I don’t know why, but I always thought BB creams were supposed to be moisturizing. That’s crazy how this one’s drying on dry skin. I guess it’s to keep the skin matte for people with oily skin? Yes, I think you’re correct! I believe the drying aspect on my dry skin probably manifests as oil control on oily skin. but it looks a bit too glowy?i guess that’s because you prep your skin with some moisturising skincare..
It’s a lot less glowy in person! I may have to retake this photo in a different room. As mentioned in my photo caption, that “shiny spot” is really a result of my bathroom lighting. I recently added a new lightbulb in there, and although I can’t see the glow when I’m doing my makeup, it seems to appear in photographs. Lighting can be so tricky! The #1 Natural Beige is the lighter of the two. I am using #2 Calm Beige in this review, in case that helps. Do you know what Missha color do you normally wear? If you are normally a 13 or 21, #1 should be light enough for you! Yep, it dilates blood vessels & lung tissue which increases oxygen in the veins, so maybe helps with skin repair? That would make sense! I find it interesting that the same fungus that boosted the performance of Chinese Olympians is also good for our skin. Who knew?